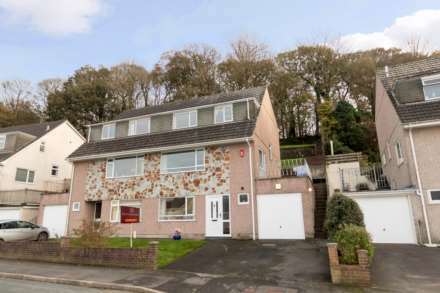 An ideal family home in a popular location. This property has been extended to provide a large, fitted kitchen to the rear of the property. There is a large living room and separate dining room allowing space for the family. The southerly facing rear garden has both decking and lawn from which there are panoramic views. Accommodation also comprises of an entrance porch, entrance hall, three bedrooms and a bathroom. Superb views of the surrounding area can be enjoyed from the bedrooms to the front of the property. Viewing of this house is highly recommended. Double glazed entrance door into the entrance porch. Timber panelling to dado rail height. Glazed door through to the entrance hall. Stairs rising to the first floor with under stairs storage cupboards. Hardwood flooring. Storage cupboard. Single radiator. Door into the living room and dining room. Narrows to 3.30 m at one end. Hardwood flooring. Double radiator. Double glazed windows to the front. Period style working coal fire surround with cast iron grate and tiled inserts. Open plan into the kitchen. Fitted kitchen with a range of base and eye level storage cupboards. Roll edged work surfaces. One and a half bowl sink and single drainer with mixer taps. Space for gas fired range cooker. Double glazed window overlooks the rear garden. Space for American style fridge freezer. Integrated dishwasher. Open arch to the kitchen. Double glazed door to the side aspect. Plumbing for washing machine. Access to the loft space. Double glazed window to the side aspect. Doors into bedrooms and bathroom. Double glazed windows to the front providing panoramic views over the surrounding area. Measurements taken to a range of fitted wardrobes which run the length of one wall. Single radiator. Double glazed windows to the rear. Natural wood effect laminate flooring. Radiator. Double glazed windows to the front providing panoramic views over the surrounding area. Single radiator. Suite in white comprising bath with separate shower unit over. Pedestal wash hand basin. Low flush WC. Tiled walls. Obscure double glazed window. Fenced garden predominately laid to lawn with a variety of plants and shrubs bordering. Driveway leads to the single garage. Steps up to a raised seating area with decking leading to the garden itself which is predominately laid to lawn with plants and shrubs bordering.